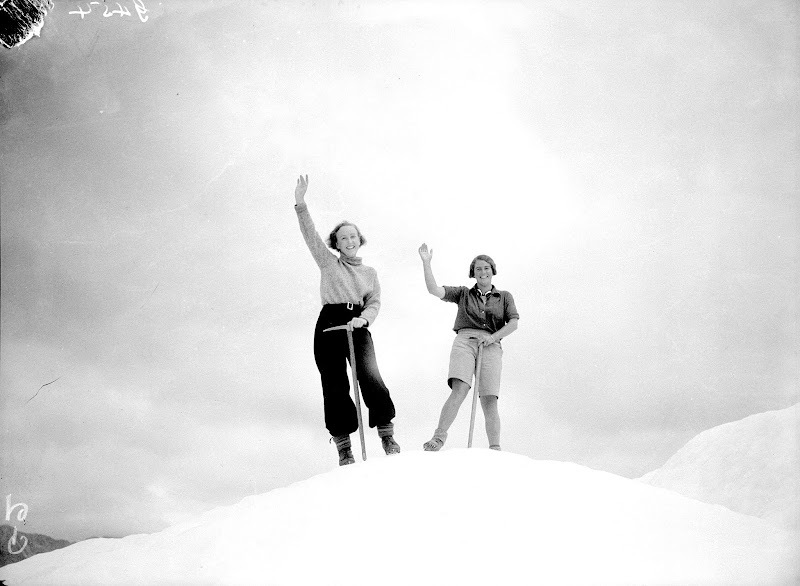 Photo of two New Zealand guides at Mount Cook, New Zealand, on top of the Tasman Glacier, 1935. I'm in New Zealand (in the dead of winter), jumping around the North Island for the rest of the week! If anyone has any great recommendations for NZ, specifically Wellington, I'd be so grateful. Back to the blog next Monday, but feel free to follow the adventure on Instagram (@lgmettler). I am a Canadian tomboy dating the sweetest LA boy who is currently residing in New Zealand! He's only been there for 3 weeks of his 4 month stay, but has been loving his time there and has discovered lots of good restaurants and bars in Auckland that I thought I could share with you. I am headed there in a few weeks myself so I am keen to try his favourites, and I look forward to reading about more of your discoveries too. Have a lovely time! -Federal Delicatessen: sits beside Depot and has an american theme/vibe and is also a lovely place to wait for your table at Depot. -Best Ugly Bagels: in all honesty, he's not yet been here, but I am including it because they make Montreal bagels which, in my opinion, are the best in the world! -Little and Friday: beautiful sweet and savoury midday treats. -Racket: a rum bar with a friendly bartender who'll teach you the secrets of rum! Hope you really enjoy NZ! We write a blog about Hamilton, the medium sized North Island city, definitely recommend stopping by on your way to Wellington for a more laidback vibe. Saw this post and thought I'd quickly jot down a few things... The Bay of Islands area is my favorite for sailing (I think there are around 100 islands off the coast there. My husband and I had one all to ourselves on one trip). There is a great overnight hiking hut trip to the Pinnacles in the Coromandel, and Huka falls and river (Huka Lodge is amazing for fly fishing and in general) is a must see. In Auckland: Fred's, Little and Fridays (it's in a fabric store, which really adds to its charm), and Supreme have great food and coffee. Coffee is brilliant here... probably better than anywhere else I've traveled. Depot and Clooney are my favorite restaurants, and Fabric (Isabel Marant, Kapital, Gitman Brothers etc...) on High St. is my favorite boutique. I'll end it there for now. I have been coming here off and on for a few years for work, and it's a great place. Have a blast! Hello, I'm an Australian who for the moment calls Canada home but has spent lots of time in NZ on surfing and mountain biking trips. Surfing-check out Raglan-really cool little surf town and great long lefts. Also the Coromandel Peninsula-Shipwrecks Bay has a great fun mal wave in the right conditions. For mountain biking, Rotorua is awesome and has some great single track. Hey! Love your blog. I'm a Kiwi and lived in Wellington for a couple of years. It's my favourite place in the world (even when the weather is less than stellar). Try Memphis Belle and The Hangar for world class baristas. Fidel's Cafe at the top of Cuba Street has the best cafe food. See if you can find Alice (hint: inside Boogie Wonderland) and also visit Motel for a Mad Men style drink. Chow has amazing Asian-style cuisine. Small sharing plates and great cocktails. The Library is also a great place for dessert and/or a nice whiskey. These are all so great and sooooo helpful! Thanks a million!!!!!!! make sure you climb Rangitoto, the volcano in Auckland harbour and head for the west coast black sand beaches to have your "Piano" moment. You can't leave without going to TePapa in Wellington too. All the Best! I love Wellington, even in winter! I like Unity Books on Lambton Quay, the Maritime Museum , Cuba Street , kayaking on the harbour, swimming at Freiburg pool and drinking a flat white at any of the marvellous cafés. I did an internship at the World of WearableArt there a few years ago and was incidentally in foodie heaven! I second hitting up Chow. Yummmmm. KK Malaysia is swoon worthy, especially the roti chanai. Also Kaffee Eis is really worth a trip for some out of this world gelato! Don't leave the country before eating a meat pie. Absolutely necessary. my favourite place in Wellington is Maranui Café, right on the Lyall Bay Beach. Divine Milk Shakes, funky interior and great views. Other things to do in Wellington would be Te Papa (for rainy weather days) or Makara Peak Mountainbike Park (for sunny days). Have fun & enjoy the world's most beautiful country.